Today was the first day of the 31st Legislative session. Things started off on a positive note as newly elected members were sworn in and took the oath of office. Lieutenant Governor Kevin Meyer gaveled in the Senate in normal fashion. After the selection of a President pro tempore, Senator John Coghill (R – North Pole), Senator Cathy Giessel (R – Anchorage) was elected Senate President. However, things got contentious in the House as soon as Lieutenant Governor called the House to order. 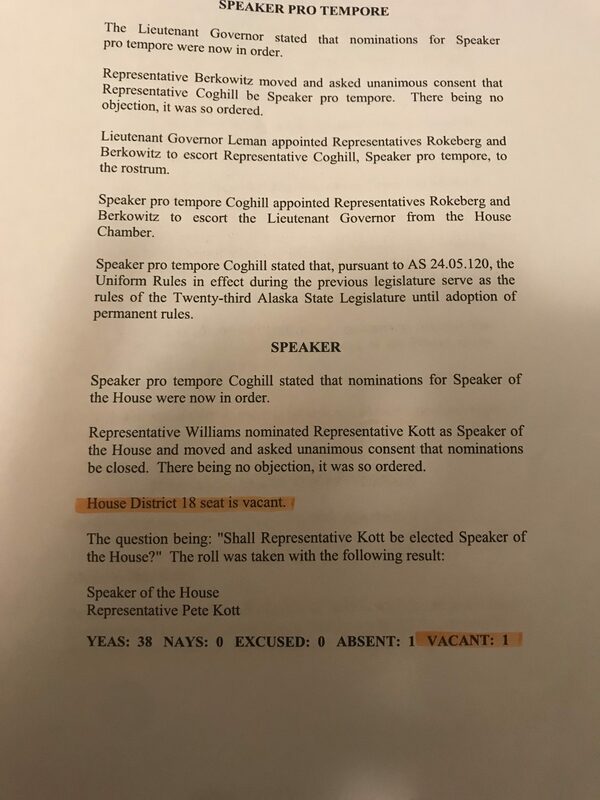 Because there is no clear majority in the House, the selection of a Speaker pro tempore, normally a formality, and then a Speaker did not happen. In addition to not being able to choose leadership positions and form committees, this has created another issue. Sharon Jackson, who was selected to replace Nancy Dahlstrom, is not able to be seated until she can be confirmed by a majority of House Republicans. Last week I published an article, I’m sorry Ms. Jackson, Republicans are for real, that explains the situation. 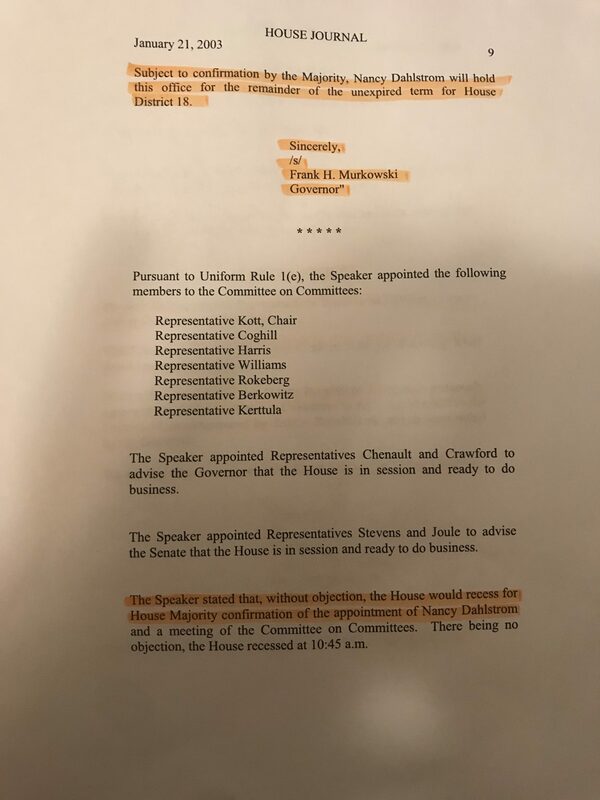 Meyer has told multiple people, including me on a recent podcast, that his powers were limited to gaveling in the House and selecting a Speaker pro tempore. Representative Tuck told me his coalition thought something like this might happen before Meyer told people this was beyond his authority. It was clear Democrats were caught off guard by the looks on their faces when Meyer attempted to transmit the message from the governor directly to Representative Dave Talerico (R – Healy) so Republicans could vote to confirm Jackson. The interesting thing is this is not the first time this has happened. In fact, an identical scenario occurred almost 16 years ago to the day. In 2002, Lisa Murkowski was re-elected to the House. In that same election, her father, Frank Murkowski, then a senator was elected governor. Not long after he was sworn in as governor he appointed his daughter to his former senate seat. 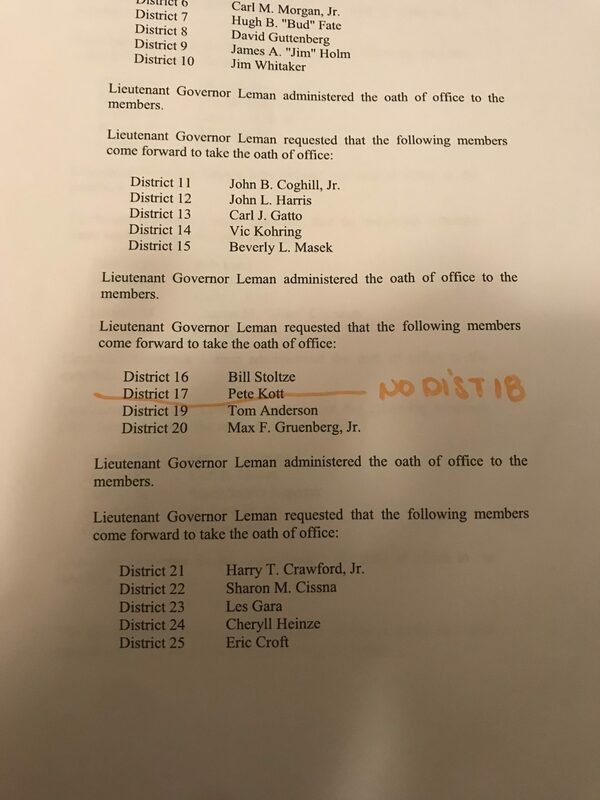 Lisa resigned from the House on December 20, 2002. 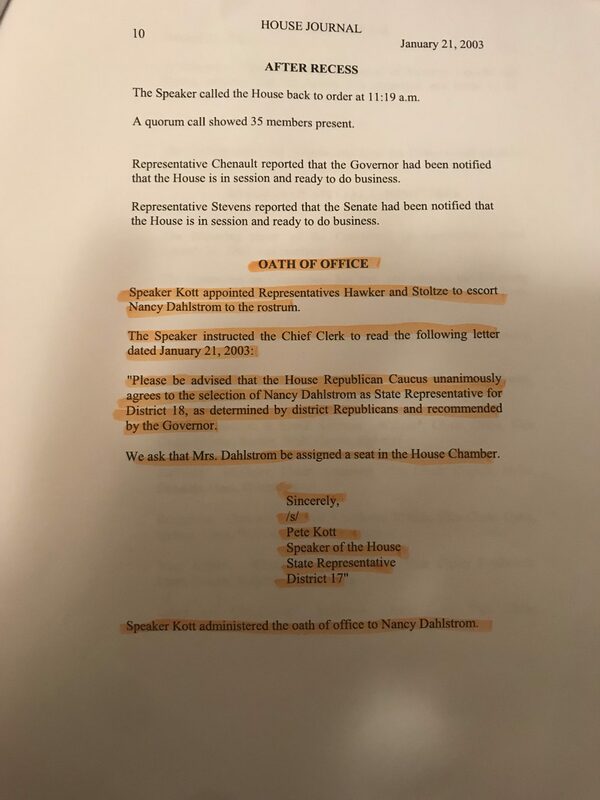 And then Governor Murkowski appointed, guess who, Nancy Dahlstrom to Lisa’s House seat. Only in Alaska. Dahlstrom seems to have a knack for being involved in these situations. The transcript of the first day of that session shows how this is supposed to work. Then Lieutenant Governor Loren Leman gaveled in the house. John Coghill was elected Spearker pro tempore. Then Pete Kott was elected Speaker of the House. 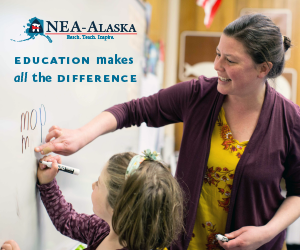 Kott then accepted a message from Governor Murkowski announcing he had chosen Nancy Dahlstrom to replace Lisa Murkowski. The House then recessed so she could be confirmed by Republicans. Once she was confirmed she was then sworn in. 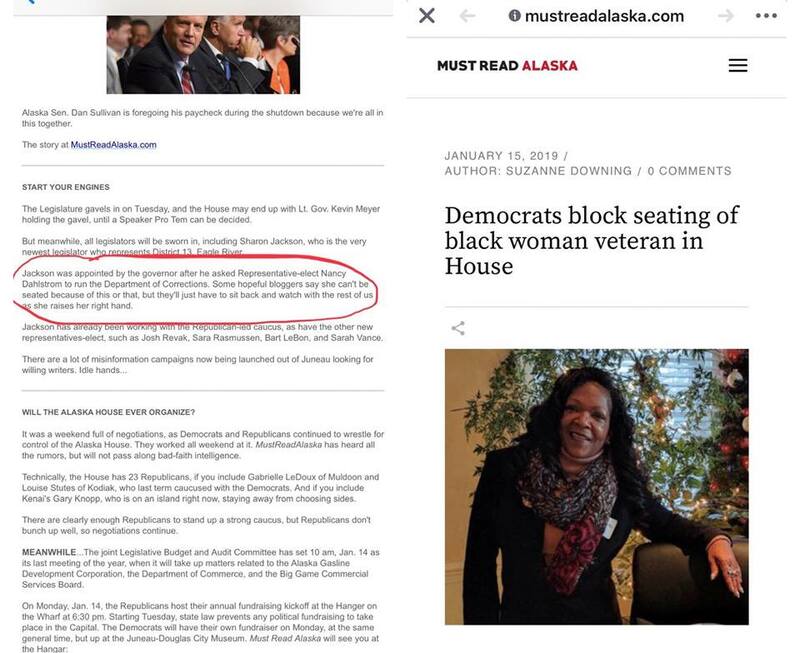 In what may be the biggest irony of the whole situation is what the Alaska Republican Party mouthpiece, Suzanne Downing, had to say about this. First, she announced in her newsletter that Jackson was going to be seated despite what “some hopeful bloggers” think. Unlike her I actually did my homework on the situation. It’s clear she was made aware of the attempted maneuver by the administration. Once she was proven wrong she immediately resorted to using identity politics as an excuse for what happened. She is quick to use the same tactics she routinely condemns when it benefits her side. The hypocrisy is incredible. Obviously race has nothing to do with this. The color or gender of the person chosen to replace Dahlstrom wouldn’t matter. Democrats have leverage and they are using it. Republicans would do the same thing if the situation was reversed. After the way Republicans have treated Democrats the last few years, you can’t really blame them for not rushing to help the Republicans out. 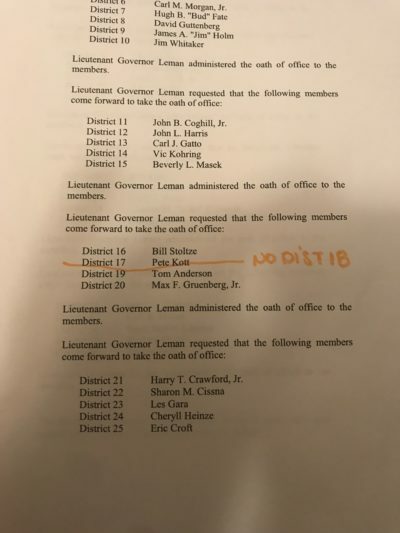 And the fact stands that the rules are clear on what the lieutenant governor can do in his role. Meyer himself even said he does not have the power to transmit messages from the governor. 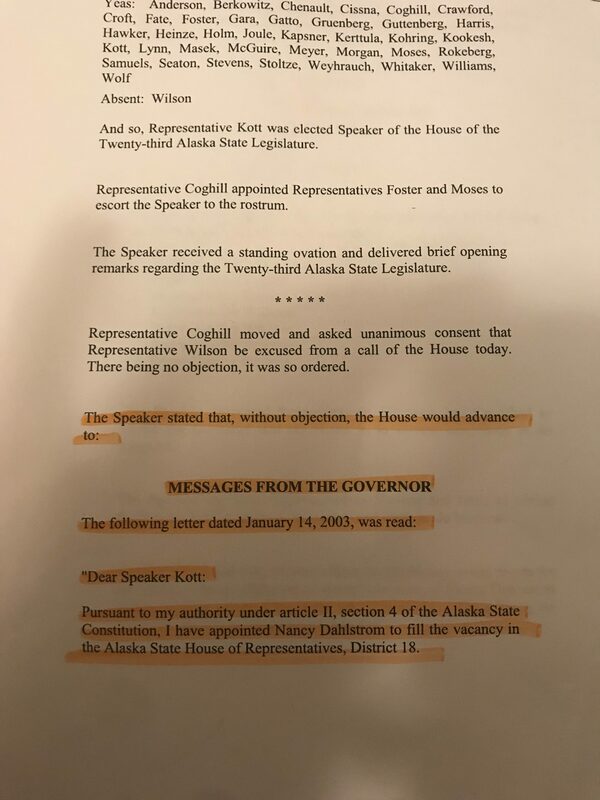 The other interesting thing is the difference between the letter sent by then Governor Murkowski to the House and the one Governor Dunleavy recently sent. 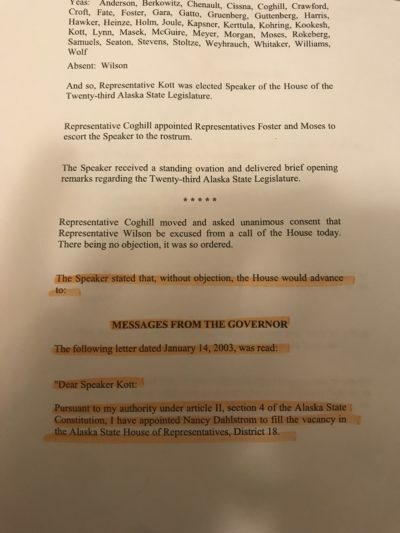 Murkowski’s was addressed to Speaker Kott, Dunleavy’s was addressed to Republican Members. Even Republicans seem to realize the predicament they are in. 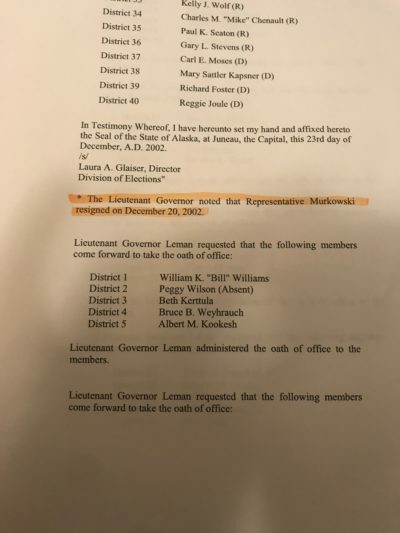 Also, when then Governor Walker sent messages to the House announcing he had chosen John Lincoln and Tiffany Zulkosky to fill vacant seats, they were both addressed to Speaker Edgmon, not Democratic Members. It will be interesting to see how this all plays out. Regardless, the first day of the 31st Legislative session has had a rough start in the House. Even if Jackson is confirmed, Republicans still only have 20 members, which is one shy of what they need for a majority. 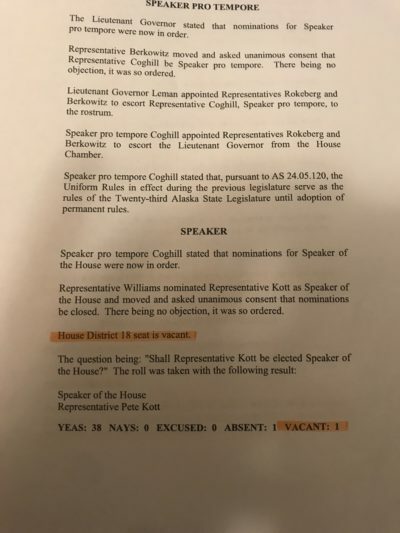 Representative Gary Knopp (R – Kenai) has made it clear he wants a bipartisan coalition and will not rejoin the Republicans. As Tom Hewitt said on Twitter, things are real loose in the House. The only thing that would make this situation more amusing is if two of the House Democrats pull a Lindsey Holmes solely to vote in a speaker, confirm Jackson, and get the session underway. What a great article. I am glad I stumbled onto your website Jeff. I will bookmark your site and check it out regularly. Very informative and refreshing.